Apple is likely to win a patent dispute against Motorola related to photo gallery scrolling on a touchscreen device, as the smartphone "war of attrition" continues. Intellectual property expert Florian Mueller with FOSS Patents used the phrase "war of attrition" to describe the ongoing conflict between Apple and Android-based handset makers. He revealed that a German court indicated this week in a hearing in a lawsuit between Apple and Motorola that the Android photo gallery is likely in violation of an Apple patent. "The court doesn't have much doubt about the validity of this patent and appears rather convinced (at the end of the hearing even more so than at its outset) that the Android photo gallery constitutes a violation of that patent at least in its 'zoom in' mode and possible (though this is not yet certain) in its 'zoom out' mode," Mueller wrote. 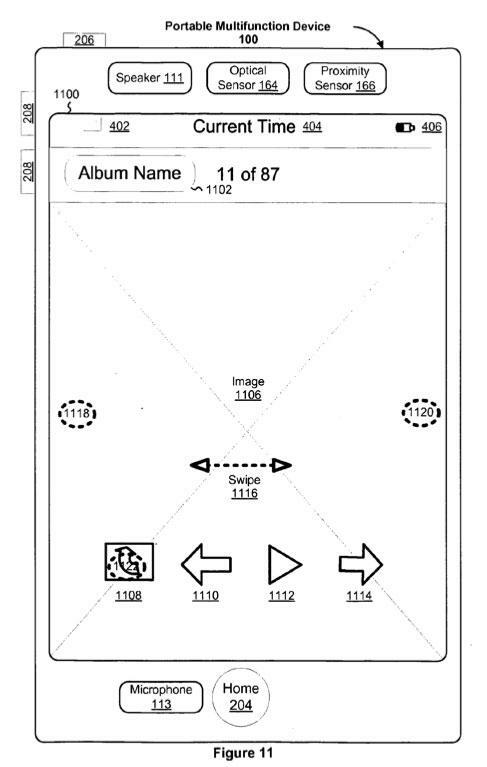 The patent in question is European Patent 2059868, entitled "Portable Electronic Device for Photo Management. It was awarded in September of 2010. Though he said Motorola isn't particularly frightened by possibly losing to Apple in the Munich I Regional Court's ruling in February, it would be yet another example of Apple winning against an Android handset maker without a single "knockout" blow. It's likely that a victory would require Motorola to modify its software and work around Apple's original ideas. That's exactly what happened with HTC, which was found this week by the U.S. international Trade Commission to be in violation of a "Data Detectors" context-aware patent from Apple. A day after the ruling, HTC was already said to be testing phones that worked around Apple's intellectual property and would not be in violation of it, allowing HTC to sell its phones and avoid the ITC injunction. Apple also had initial victories against rival Samsung over its patented designs for the iPhone and iPad. Samsung responded by redesigning its Galaxy Tab 10.1 touchscreen tablet in Germany, which allowed the company to begin selling the device and is expected to withstand legal threats from Apple. Mueller said Apple's "war of attrition" may not have an immediate impact on Android and competing handset makers, but over time it could chip away at the functionality found on Android devices. "While one or two wins of this kind won't be enough to change consumer preferences, the aggregate effect of the enforcement of a half a dozen or more patents of this kind could make an appreciable difference in user experience," Mueller wrote. "Apple is fighting for long-term opportunities. As long as it doesn't come under enormous pressure, it can afford to crack one nut at a time, country by country."